JIN-WEN YU DANCE & the UW-MADISON DANCE DEPARTMENT presented Page 20, a contemporary, cross-cultural, multi-media dance concert, featuring the award-winning choreography of Professor Jin-Wen Yu, who celebrates 20 years at the University of Wisconsin-Madison Dance Department. 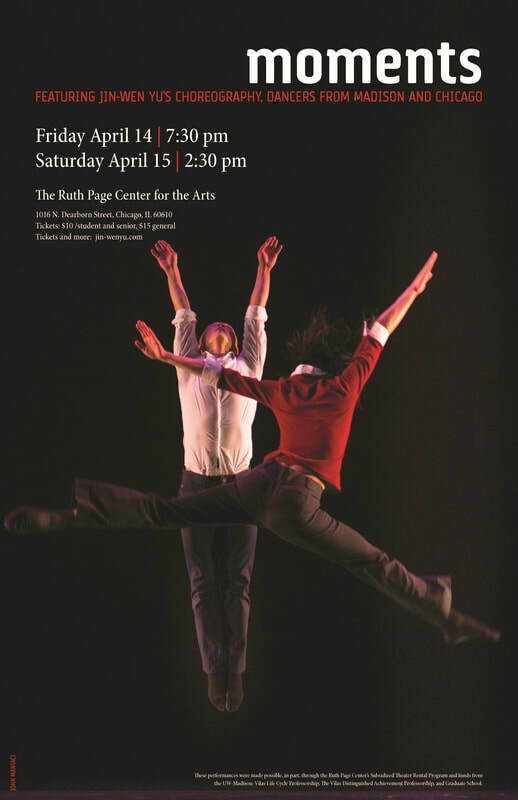 Yu presented new and previous choreography, including multimedia by Tingyi Lin as well as Yu's last solo performance and the first dance he ever set at UW-Madison. 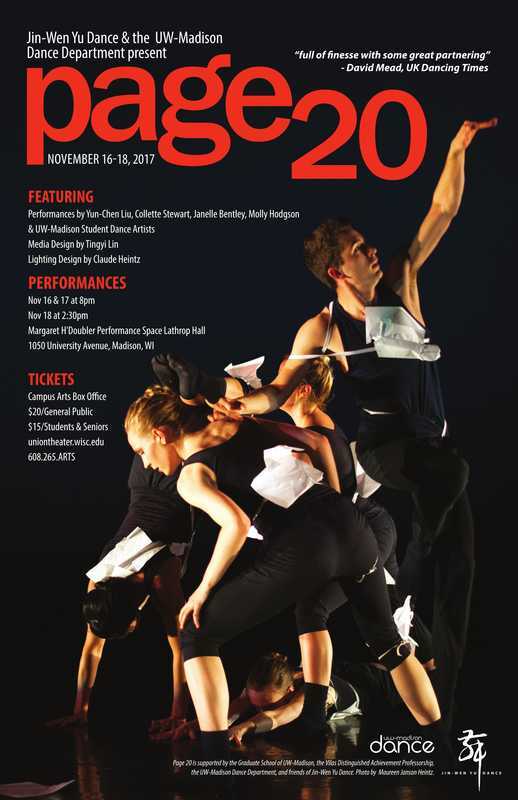 In addition to company members Yun-Chen Liu, Collette Stewart, Janelle Bentley, and Molly Hodgson, this concert also featured talented students from the UW-Madison Dance Department. relationship to the delicious “Je t’écrirai” by Alain Lemauff"
it was "full of finesse with some great partnering"
The concert’s first half featured a 50-minute work titled “Paging," part of a larger project to be premiered in Madison in 2019. "Paging" included a solo, trio, quartet, two quintets, and a group section. The second half began with a duet titled “Two,” a sensually-charged and physically-engaging piece performed by Yun-Chen Liu and Lauren John which explores the interplay of two female bodies with great partnering work. Yu's emotional solo performance “Departure” followed. The last piece was an award-winning ensemble work titled “Drifting.” Yu created the piece in 1997, which won regional and national gala awards from the American College Dance Festival. Page 20 was performed Thursday, November 16 and Friday November 17 at 8:00 p.m. There was a matinee performance on Saturday November 18 at 2:30 p.m. All performances took place in the Margaret H’Doubler Performance Space, Lathrop Hall, 1050 University Avenue, Madison WI. This project was supported by the Graduate School of UW-Madison, the Vilas Distinguished Achievement Professorship, the UW-Madison Dance Department, and the friends of Jin-Wen Yu Dance.